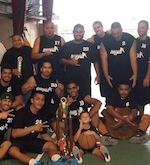 The Stingers of Samoa defeated Mesepa 68-64 to claim the Moso'oi Basketball Tournament. The Uptempo-Leone semifinal game was cancelled because of a massive brawl and the Stingers were crowned champion after their semifinal contest vs Mesepa. Leone and some fans got into it in the second quarter of the game with Uptempo leading 33 - 19. The American Samoa Basketball Association disqualified both teams on the spot because both benches had cleared during the brawl. Mesepa and the Stingers were supposed to have competed in the other semifinal game but the disqualification transformed their semi-final contest into the championship match. In the fourth quarter of the game, the Stingers were sitting comfortably on top with a 15 point lead, 59 - 44 after a put back by Tony Schwenke. Mesepa called timeout, and with the score at 61 - 46, Foe Fa'alili dropped a three on the Stingers while Eugene Brown scored on a fast break to cut the lead down to 10 with 5.08 remaining. This time it was the Stingers calling for a break, because they were playing sloppy ball by turning it over and putting up bad and ill-advised shots. Fa'alili, the game's MVP, took over as he brought Mesepa on a near comeback win by sinking some great shots from beyond the arc. He buried a trey and scored another on a turnaround, while being closely defended, to make it a four-point game, 61 - 57. The visitors from Samoa scored a much-needed basket to extend the lead to six, but Fa'alili came back with another huge three-pointer falling out of bounds for a 63 - 62 score. Schwenke had played solidly for the Stinger down low, and he scored on of two free throws to make it a two-point game. Fa'alili missed a shot, but Vailili Malauulu was right there for the put-back to tie it 64 -64 with 2.43 remaining in the match. A foul sent Stefano Collins to the line, and he sank one-of two to give the Stingers the one point, 65 - 64 lead. The Stingers followed it up with a basket for a three point difference, and Vise Niko made it four after sinking on of two shots at the free throw line. Fa'alili tried one more shot from outside, but he was fouled. He missed all three attempts at the line, and that was the end of Mesepa's last gasp at a comeback win for the title. Fa'alili finished with 34 points on 11-of-19 shooting and did not get much help from his teammates, as he was the only one to score in double figures. He also had three steals and four turnovers. Malauulu scored nine on 4-of-13 shooting for Mesepa, grabbed eight rebounds and dished off three assists to go along with a steal, a block and three turnovers. Team-mate Opeta Seu was 2-of 5 for seven points , three rebounds and two turnovers. Schwenke led the visitors with a double double, scoring 25 on 10-of-18 field goals and grabbing 10 rebounds, four of them on offence. He also had one steal and four turnovers. Team-mate Birdie Bourne shot 7-of-15 from the field for 16 points, had two rebounds, two steals and assist and turned the ball over three times. Niko was 5-of-14 for 11 points, grabbed nine rebounds and had three steals and two turnovers. Mesepa shot a better field goal percentage from the field with 38.6% of their shots going in to the Stingers 33.8 %. The battle at the free throw line was almost equal, with Mesepa making 52.9% of their attempts to their opponent's 52.6. But Mesepa was out rebounded 55 - 44, outscored in second chance points 11- 8 and had fewer points off of the bench with only seven to the Stingers 11. The champions also scored more off turnovers with a 20 - 12 edge. The appearance of the teams from Samoa has been appreciated at this tournament and it was interesting to see how the teams performed against the strong American Samoan sides in the tournament. The two teams from Falienu reached the quarterfinal stage and the Stingers claimed the trophy. Tahiti kept the perfect record and reached the Final at the FIBA Men's Polynesian Cup. They rolled over American Samoa 123-60 to finish the group stage at 4-0 record. Ariirimarau Meuel top-scored for the winners with 25 points and Heimoana Teamotuaitau netted 21. Michel Audouin and Larry Teriitemataua (G/F) followed them with 19 points each in a win. Lynel Steve Siu replied with 22 points in a loss, whilst Afimuao Nimoa'I brought 11. Samoa were dominant throughout their 99-63 win over American Samoa in their third game of the FIBA Men's Polynesian Cup at the N.U.S. Gym last night. Coach Aukusitino Schuster had emphasised fitness in the leadup to the tournament, and the benefits of this were on display in the win. 'It's a very physical and demanding game,' Aukusitino Schuster said. 'Our big bench helps us a lot.' Samoa did major damage in all the hustle stats, scoring 13 more points from turnovers, seven more second chance points and 22 more fast break points than their opposition. Bigs Theodore McFarland (20 points, 10 rebounds) and Ryan Paia (22 points, 11 rebounds) continued their good play at the tournament so far, with their work at either hoop giving Samoa a 26 point advantage in points in the paint as well. Aukusitino Schuster said they have been developing those two players since they were 17. 'Now they are starting to peak so it's worth our while, especially because they are locally based.' They looked to hit ahead in transition at every opportunity, and this commitment to pushing the pace meant they scored at least 97 points for the second game in a row. 'For our last two we've had a chance to analyse our opposition,' Aukusitino Schuster said.